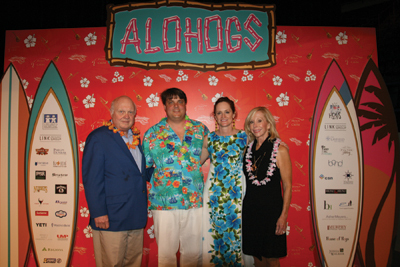 Hogs for the Cause welcomed guests to a luau at the lakefront. Guests were treated to an array of Tiki drinks and hors d’oeuvres to start the evening. A Hawaiian-themed dinner featured guest chefs for each course. Andy Ticer and Michael Hudman of Andrew Michael Italian Kitchen and Josephine Estelle teamed up with Carey Bringle of Peg Leg Porker BBQ to prepare a pupu platter starter. Guest chefs prepared the main courses: banana leaf wrapped pork by Stephen Stryjewski of Cochon and Ryan Prewitt of Pêche; spam and roasted pineapple fried rice by Chris Shepherd of Underbelly (Houston, Texas); tuna poke by Marcus Jacobs of Marjie’s Grill; or coconut milk poi by Mike Gulotta of MoPho and Maypop. Rebecca Wilcomb of Herbsaint prepared sides: options of cabbage, carrot and radish slaw or a sweet potato salad. Dessert of coconut rice and pudding and a tropical fruit salad were prepared by Maggie Scales of La Boulangerie. The Tangiers Combo entertained the 350 guests. Emcees Mark Romig and Carey Bringle conducted the live auction. The “Hogwaii” committee included Alex Layfield, Jessica Magnum, Kate Gilly and Claire Thriffiley, with Alex Pappas on décor. “Hogs for the Cause” is the premier funding source for pediatric brain cancer outreach services in the United States, and has given grants to more than 400 families in need, as well as given grants to children’s hospitals in New Orleans, South Carolina and Atlanta.